One of our sweetest holiday traditions is kissing under the mistletoe, but how much do we really know about this custom or, for that matter, the plant itself? Another part of mistletoe’s kissing mythology is part of a Norse legend. Frigg, the goddess of love, was so grateful when her son Baldur was raised from the dead (after being killed by an arrow of mistletoe wood), that she praised the plant and promised a kiss to all who passed beneath it. Stealing a kiss under the mistletoe is believed to have originated in England among servant classes in the late 1700s, and it was considered bad luck for a young lady to refuse such a kiss. While there are many ancient myths and legends from all over the world surrounding mistletoe, the traditions involving kissing are by far the most favored. Today, both fresh sprigs as well as artificial clusters and topiaries of mistletoe are available as holiday decorations, often mixed with holly or pine sprigs and accented with crystals or ribbons. American Mistletoe (Phoradendron spp.) 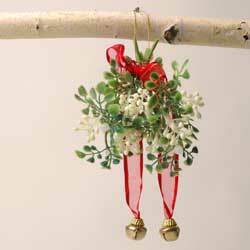 is one of 1,300 species of mistletoe worldwide but one of only two that are native to the United States. Our mistletoe is a semi-parasitic, shrubby plant with oval, evergreen leaves and long clusters of sticky white berries. This plant roots itself in trees and survives mostly off its host’s life support system. But, despite its parasitic tendencies, mistletoe has been a natural part of healthy forest ecosystems for millions of years, and can even promote biodiversity as other seeds stick among the mistletoe and sprout. Mistletoe is poisonous to people, but the berries and leaves provide high-protein food for many animals. Many bird species rely on mistletoe for food throughout the winter and nesting material in the spring. Butterflies lay their eggs on the plants and use the nectar as food. Mistletoe is also an important pollen and nectar plant for bees. Pick-up some mistletoe and have a happy holiday!